A study by some Dutch scientists claims to have shown that WiFi kills trees [Study Says Wi-Fi Makes Trees Sick]. Combine that with the widespread myth evidence that WiFi radiation is harming school children [Sometimes School Trustees Make You Proud] and all of a sudden we've got a serious problem. University campuses are awash with WiFi radiation coming from sites in every building. If you are one of those people who think you're being harmed, I've come up with a simple solution—a tinfoil1 hat to protect your brain. I have carefully researched the shape of this hat in order to maximize the desired effect. Wear it when you are at your desk studying, when you are in class, and when you're taking a break. Get all your friends to wear one too. 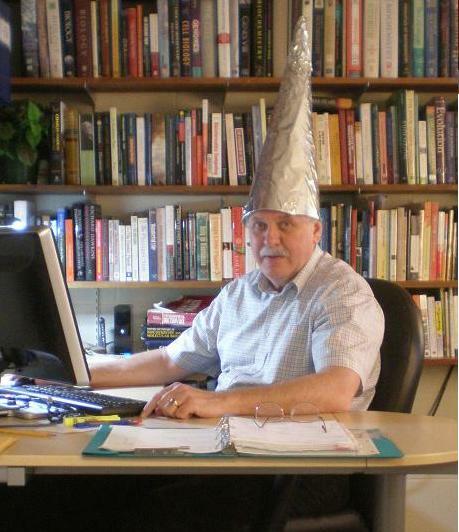 Not only will this tinfoil hat protect you, it will also serve as a reminder to others that you are an intelligent person who cares about the environment. Here's a special note to parents of school age children who are worried about WiFi radiation in the public schools. It's easy to make a protective hat. Just roll up some poster board in the shape of a cone and cover it with tinfoil. Make sure your children keep the hat on while they are in school. Your children will rapidly gain the admiration and respect of the other students for being so scientifically literate. 1. It's actually aluminum foil but who's counting? The photos were taken by Alex Palazzo who wishes to remain anonymous. (Srsly: You wore that in class? If this is an attempt to get into "Rock Stars of Science" you've got my vote. Not only will it protect your precious bodily fluids, I mean, nervous system, it is quite fetching. 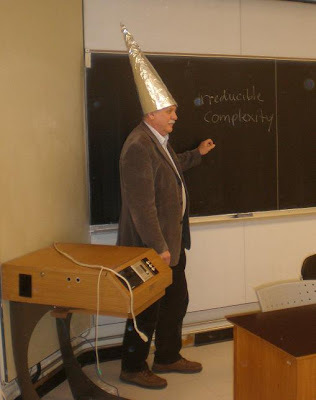 How are the students finding being taught by a man in a silvery dunce's cap? Yeah, but the foil is in contact with your skin. What about the risk aluminium poisoning? Did you think about THAT??? I also feel sick and lethargic at school sometimes. I thought it was because I was lazy, underslept, and unmotivated, but WiFi radiation sounds more convincing. Larry, you make irreducible complexity more scholarly wearing that. Not one Hogwarts joke? Inconceivable! Has anyone researched the difference in effectiveness between tinfoil and aluminum foil? Is tinfoil available anywhere any more? I am 6'4" tall. If I had to wear a hat that like the one illustrated I would have trouble getting through most doorways. Is there a shorter version which will be effective yet still as attractive? This is a difficult problem. Your conical design is clearly optimized for blocking WiFi radiation and enhancing gravitas, but what about blocking mind control? Here the beanie shape has no rivals. It seems further research is necessary to determine the best design for all-around protection. 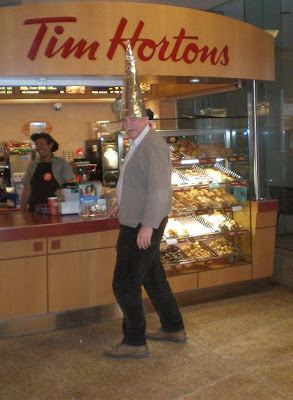 Perhaps a very large beanie balanced on the tip of the cone? Whatever the outcome of this future research, it is good to see that you have the shiny side of the foil facing outward. That is always essential. Yes, Bigjohn756, it does come in a shorter version, but for maximum effectiveness 3D glasses and a glow-in-the-dark necklace are strongly recommended, which I trust will also address your need for an attractive yet functional alternative. Still, it is not quite as effective as Larry's. See that glass of fluid? Don't be tempted into thinking it's red wine. Evidence shows, however, that there is less bodily fluid seepage than you would find seeping from an unprotected head (which fills entire bottles). (I do hope the pic shows up or this posting will seem weird, and I will have wasted 10 minutes setting up a Google account as well! And rest assured, that pic won't be up for long!). Don't you realize that the conical shape only focuses the rays? Tinfoil is out. Velostat is in. "Since trying Michael Menkin's Helmet, I have not been bothered by alien mind control." - how can you beat testimonials like that? hhhmmm...not such a good idea in a thunder storm - you might find that you attract a WiFi signal from on high that you didn't bargain for; especially as you're an unbeliever and all that. Tell you what, I'll put a good word in for you during my prayer time. You'll find my bargain basement intercessory prayer rates are far more competitive than your average top of the range TV evangelist. But if you really want protection—full body protection—you should go for the tinfoil burka. Cute! But someone somewhere will take your hat seriously. Even the TV snippet on this pointed out that the damage was within, what, 0.5 metres of the broadcasting equipment? So I wonder if they could account for any browning of leaves by higher temperature in the vicinity drying them out. And I'll bet there was no control for that. Speaking for those who experience obvious effects from wi-fi (some are more sensitive than others), I have to say it's nice to be able to give the subject some humor. What is the difference between tin and aluminum after all? From what I've heard, aluminum theoretically shouldn't have a shielding effect yet it still appears to do something in regards to wi-fi. Umm, you do know that an MIT student turned a network analyser on the old foil hat thing, to find out what they actually do. Turns out... they amplified the very military-band frequencies suspected to be involved in mind control. Wouldn't this hat have to be electrically grounded? 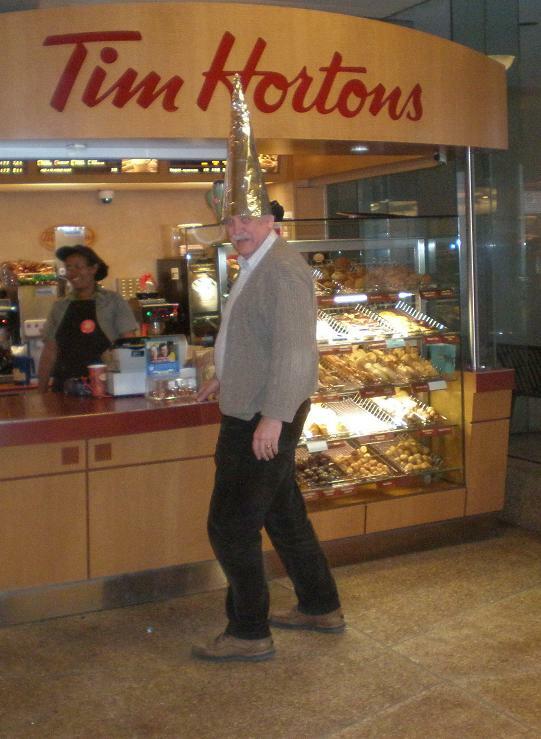 I'm quite sure this is too old for any response, yet I was wondering, wouldnt it be better to keep the metal hat from touching you? It would seem that the current travels into the helmet, and into my head via the points of contact. I can feel it in the one I've built, and I'm wondering how you would prevent this side current from trveling into my head via points of contact w the metal. I lives near mobile tower, We decided to stick aluminium sheets on our wall and windows to prevent radiation, I like to know if aluminium foil cated with soem insulated pain on both sides can prevent radiation , or we have to go with plain aluminium sheets ? Please Help me in choosing .